We are the solution to your transportation needs. We are first in service, and even then extra effort is standard. 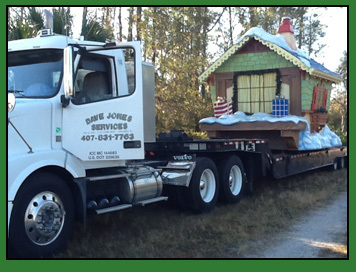 Dave Jones Services is your reliable transport solution when you need to move equipment, vehicles, machinery and special loads. We specialize in professional, worry-free transport service across the southeast, and offer access to a network of trusted, quality transport and logistical services to get your load where it needs to be on time, every time – anywhere in the continental U.S. Call us to inquire about your needs. Our clients include Walt Disney World, Trane Rental Services, United Rentals, CVS and Walgreens pharmacies.